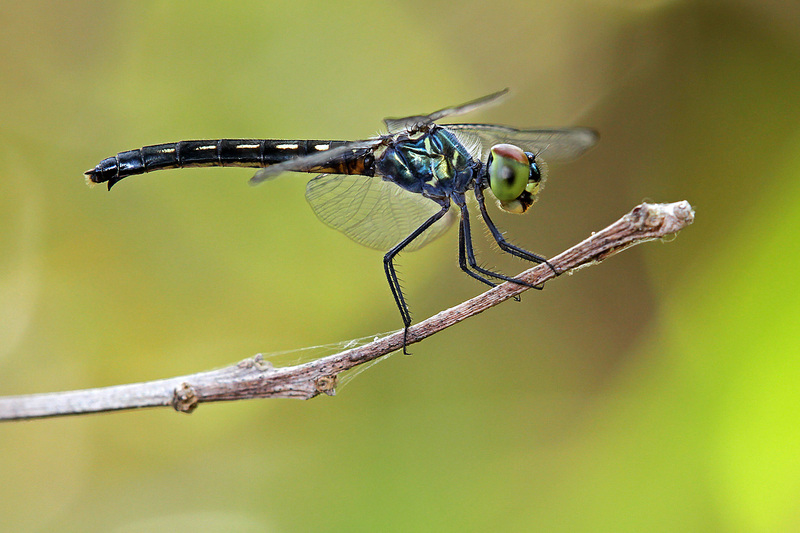 This is an uncommon dragonfly and is one of the few species that lives and breeds in saline water in mangroves. Both the male & female are small in size about 2.5 cm long. 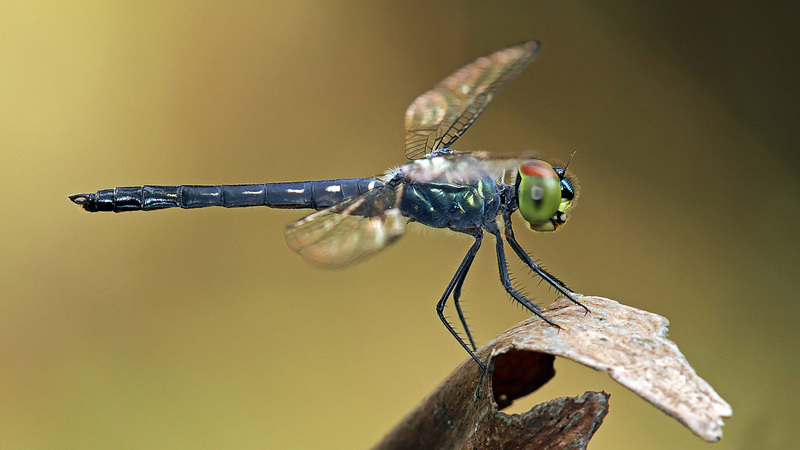 Accordingly to Mr Tang Hung Bun’s Dragonfly Book, the Mangrove Dwarf has been recorded in Changi, Mandai, Pulau Semakau, Pulau Tekong, Pulau Ubin and Sungei Buloh Wetland Reserve. I first saw the image of a female taken by my friend, Yan Leong, in August 2010 and subsequently, a male captured by Allan Lee in December 2011, both found at Chek Jawa mangrove in Pulau Ubin. An internet search reveals that not many people have photographed this mangrove species. Those who were lucky usually spotted them at Chek Jawa. I have wanted to photograph this uncommon dragonfly for a long time but I just didn’t want to bother Yan Leong or Allan to bring me all the way to Chek Jawa, Pulau Ubin. 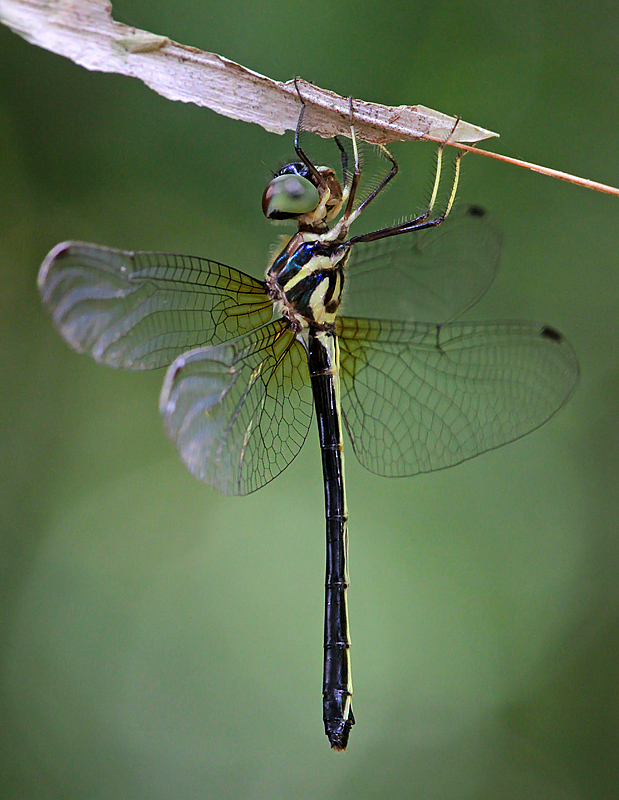 It was only recently when I met Loh, someone who is probably more crazy about dragonflies especially mangrove species than me, at Zhenghua Forest where he shared his well-captured images of both the male & female of this dragonfly. 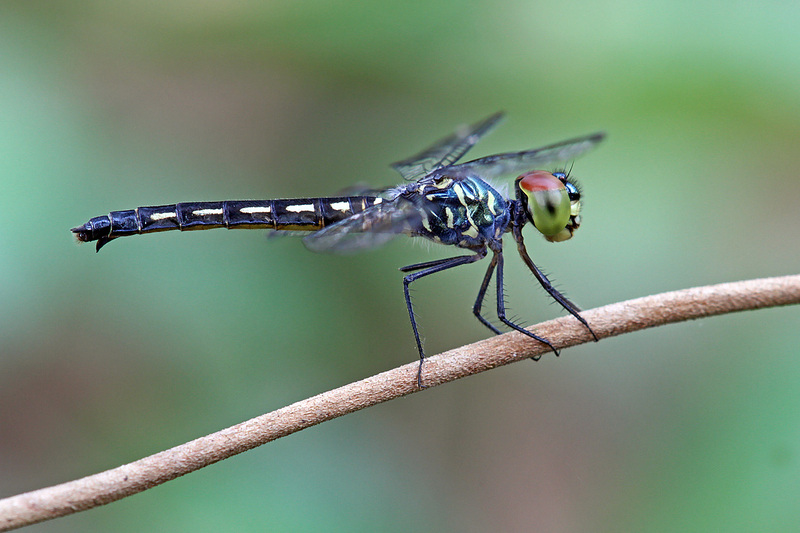 He shot them somewhere at Pasir Ris Farmway and it appears that this dragonfly species is a permanently resident there. I requested that he brings me along of his next visit. Yesterday, I met him at the entrance of Pasir Ris Farmway. We drove a short distance from here and park our cars near the main road side. 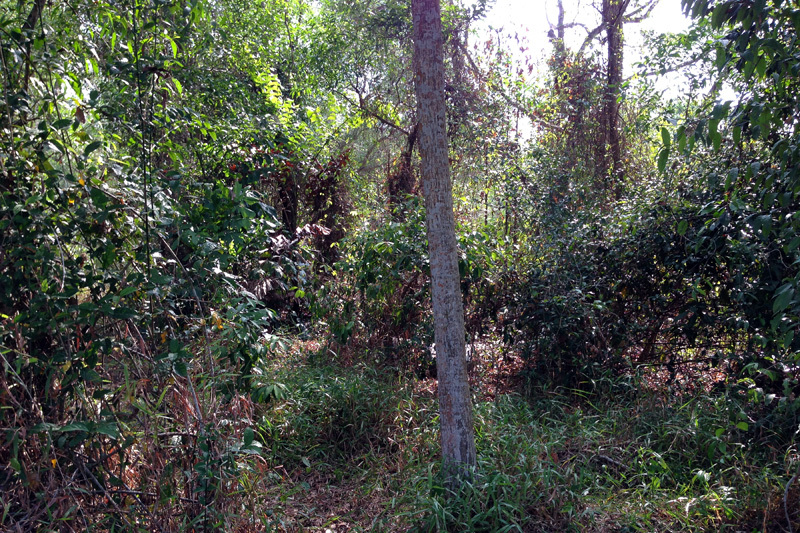 On the right is a small forested area which looks very ordinary to me. There are no mangrove swamps in sight and I would never expect to find this species here. I think Mr Tang Hung Bun would be surprised too! Without further delay, we crossed the road and moved into the forest. 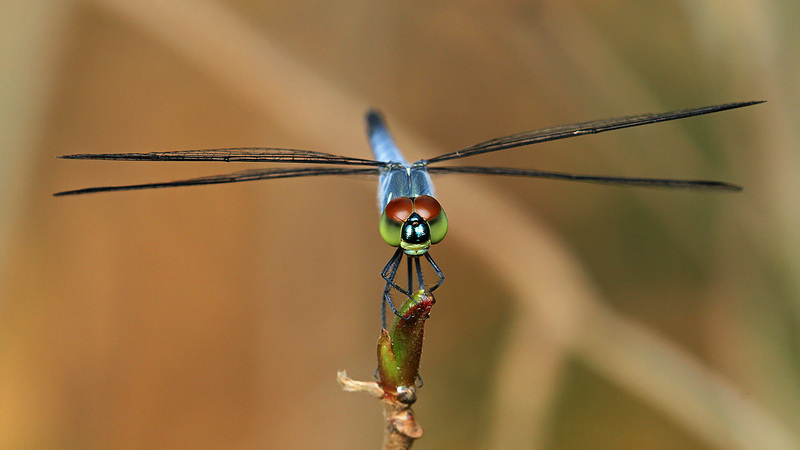 Loh showed me the small area that he usually sighted this dragonfly. 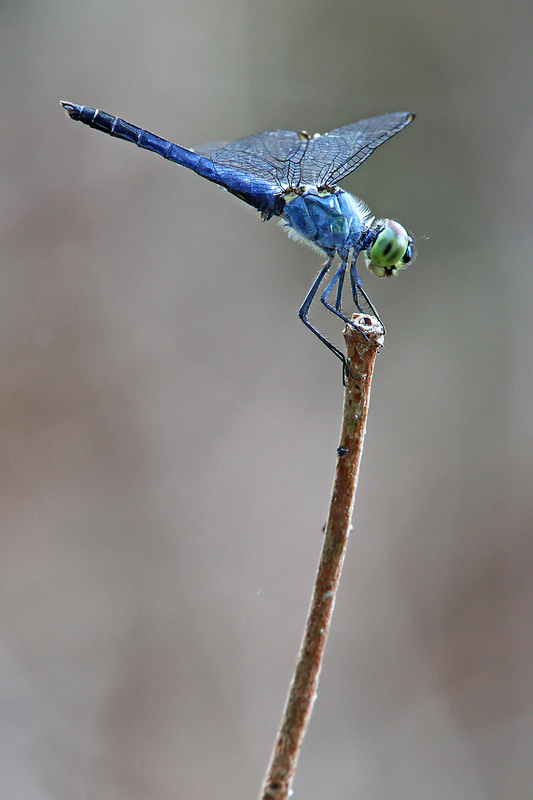 Within 10 minutes, I found a small blue dragonfly perched on a pool of fallen branches near the road side. I alerted Loh and he confirmed that this was the male mangrove dwarf! 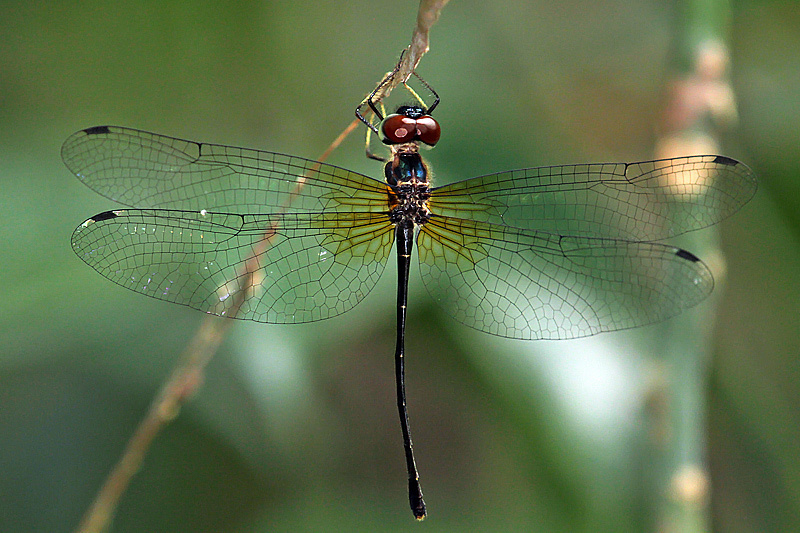 The males resemble Brachydiplax chalybea which usually perch motionless on an exposed branch for long periods, guarding their territories around a salty mangrove pool. This male fits into this description except that there wasn’t any salty mangrove nearby. I did find a small patch of muddy area with little water a few metres away. Anyway, another male was spotted high up at a branch near a spider web. A third male was found and I took the opportunity to take the front view. Here are 2 more images of the same male on the same perch. The different is that the male on the right was taken with Loh helping me to block the strong sunlight. Which one do you think is better? I shot another male but this one didn’t have the blue on its thorax or abdomen. Could this be a young or aged male? I am glad to spot a few female mangrove dwarfs too. 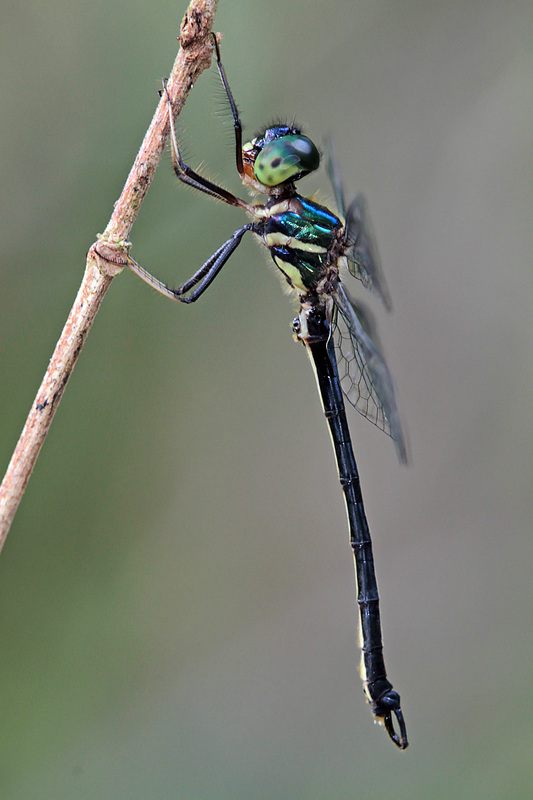 The female has a black coloured body with yellow marking on the side of the thorax and yellow streaks along the abdomen. In total, there were about 4 males and 3 females spotted within a radius of approximately 5 metres. Certainly a healthy sign of this species. I must thank Loh once again for sharing this site to me, otherwise, I would not be able to take so many decent shots of these cute little creatures. 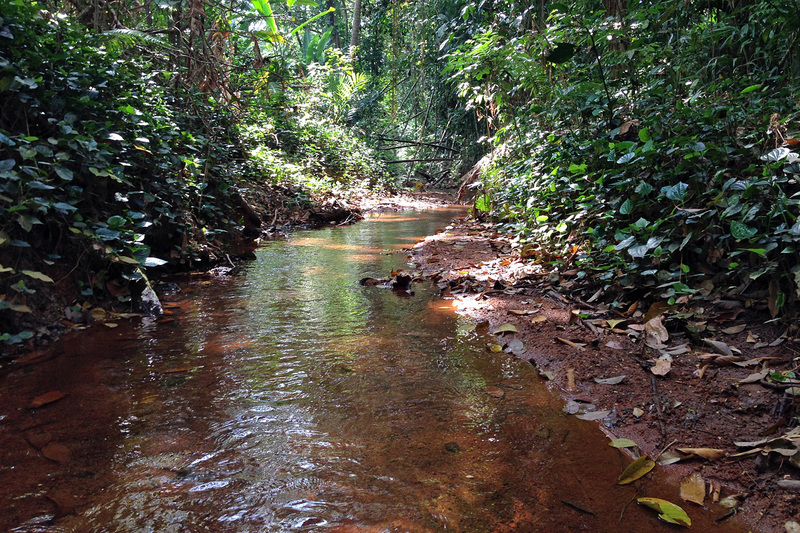 I have heard of the famous Mandai forest stream during my earlier years of photographing dragonflies & damselflies. I read that it was a good place to hunt for uncommon forest species. In particular, it was once thought that the beautiful Libellago lineata can only be sited there. I remember I tried very hard to locate this stream but without success. 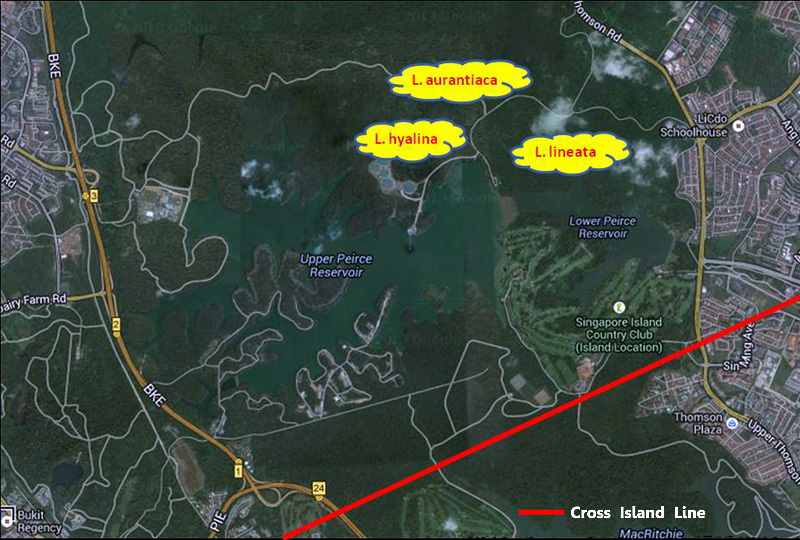 I gave up searching when I finally photographed L. lineata but at a new location at Lower Peirce Reservior. 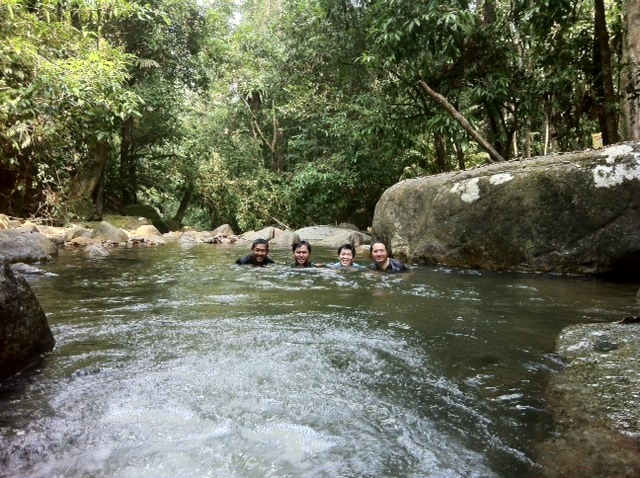 In June last year, a Facebook friend, Ronnie Ang, managed to find the Mandai stream. I requested him to bring me along the next time he visits this place again. I was glad to receive his invitation last night. Although I was working today, I did not want to miss this opportunity. 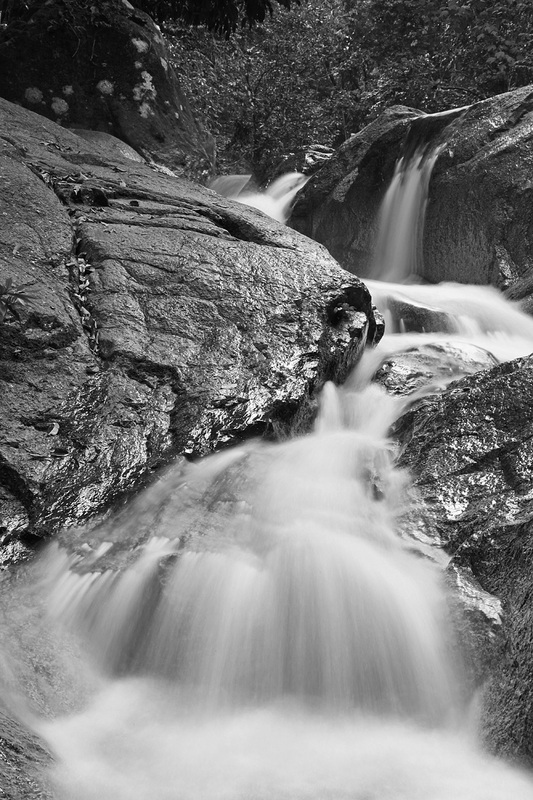 I met him and his friend, Albert this morning at 10.00 am and here is the stream that I once worked so hard to find. The water level was quite shadow probably due to the recent dry spell. We soon found a lone male Libellago lineata & Common Flashing, a few Yellow Featherlegs, Orange-striped Threadtails, Blue Sprites and Grey Sprites. While Ronnie stayed at the upper stretch to shoot Libellago lineata, Albert went further up to explore the lower stretch of the stream. As I had photographed the Grey Sprite only at Panti Forest, Johor, it is my wish to get some decent shots in my own country. Thanks to Albert who spotted a mating pair and kindly shared it with me. It perched fairly high up in a thin branch. With the wind blowing strongly, it was a challenge shooting them. Fortunately, the mating pair stayed very cooperative there for a long period. Here are my humble shots. I left at 11.45 am for work while Ronnie and Albert continued their hunt for odonates. I am certain that I would revisit this place soon. I hope to shoot together with Ronnie and Albert again. This is a sequel to my earlier video on “The Wild Side of Singapore” which was quite well received. It may not be as good as the original but there is a portion that I like best where 2 damselflies (Orange-striped Threadtail & Blue Sprite) fought for their favourite perch. Hope you enjoy it! The Wild Side of Singapore! 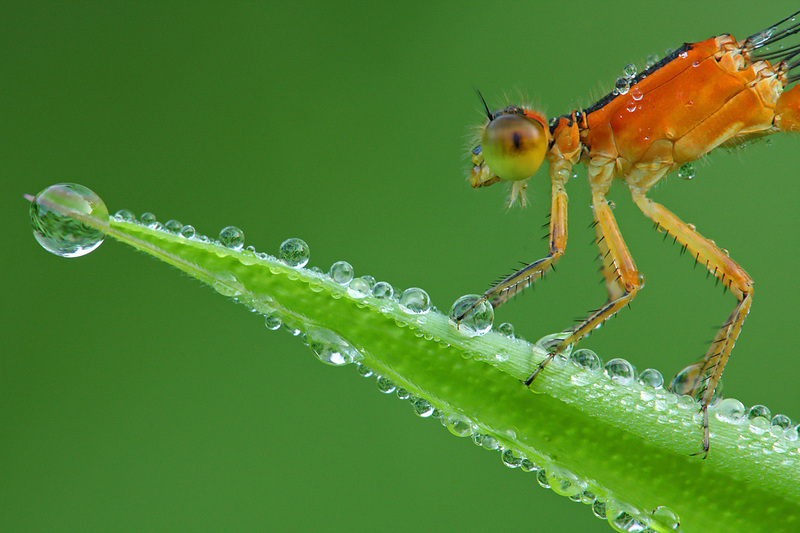 Let us take a break from dragonflies and damselflies and look at some of the other beautiful creatures that can be found in Singapore’s limited rainforests and parks. 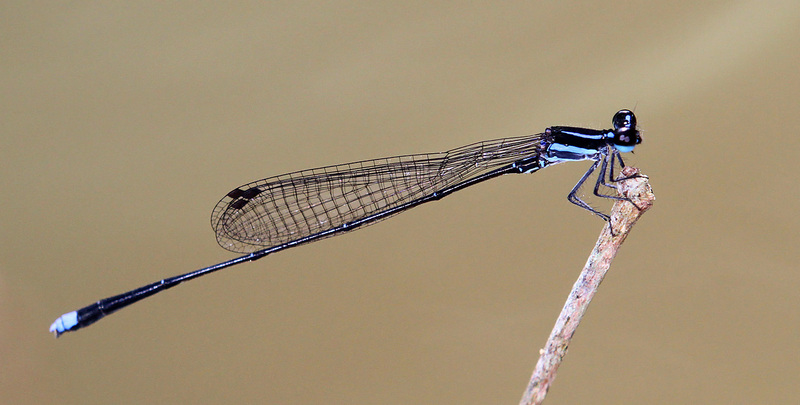 Would Singapore’s most beautiful damselfly species be extinct by the construction of Cross Island Line? 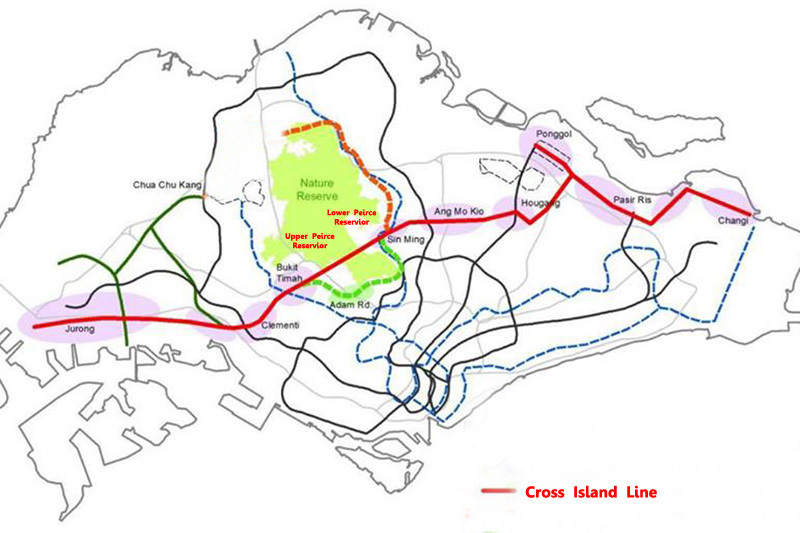 In January 2013, the Land Transport Authority announced the plan of the Cross Island MRT Line (CRL) which would begin from Changi, passing through Pasir Ris, Hougang, Ang Mo Kio, Bukit Timah, Clementi, West Coast, and terminate at Jurong Industrial Estate targets to be completed by around 2030. I did not pay attention to this news until last week when a friend shared a link regarding a petition to save Singapore’s Forest Reserves initiated by Teresa Teo Guttensohn. There was also an article on The Straits Times and TodayOnline dated 19 July 2013 where it mentioned that the Nature Society (Singapore) has opposed the future CRL and has proposed an alternative route that cuts southwards via Lornie Road around the reserve. As a nature lover who enjoys photographing insects and bugs in forested areas, I am concerned after reading the impact of CRL on Singapore’s rich biodiversity as it would cut through the southern portion of the Central Catchment Nature Reserve, between Upper and Lower Peirce and MacRitchie Reservoirs. As an ordinary individual, one of the little things that we could do is help to highlight what would potentially be destroyed by the construction of CRL. In this regard, Ivan Kwan has done a superb job in his “The Lazy Lizard’s Tales Blog” where he pointed out that many of our threatened and endangered native mammals, birds, reptiles and amphibians, insects, etc., live in these forests and any form of large-scale disturbance is likely to have adverse impacts on them. 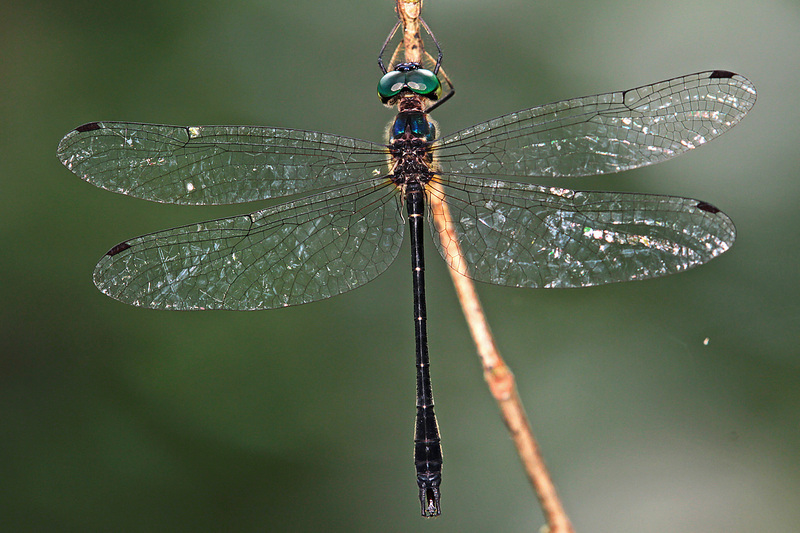 I am glad he included the uncommon Forktail dragonfly taken by me although I would have preferred him to mention Triangled Small Percher instead as it is classified in the Singapore Red Data Book 2008 as a critically endangered species which lives only in Upper Peirce forest. 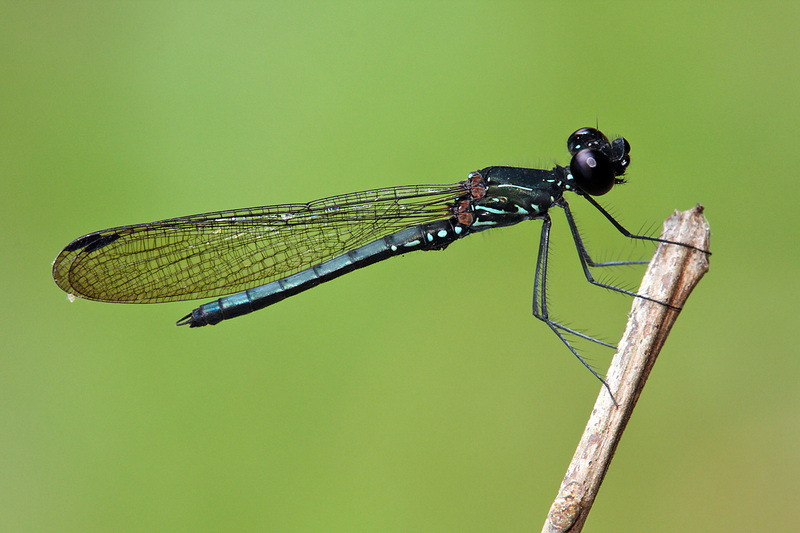 Since no damselflies were mentioned, I would like to take this opportunity to emphasize that there is possibility that Singapore’s most beautiful damselflies that happen to live in the affected areas could be extinct due to the construction of CRL. 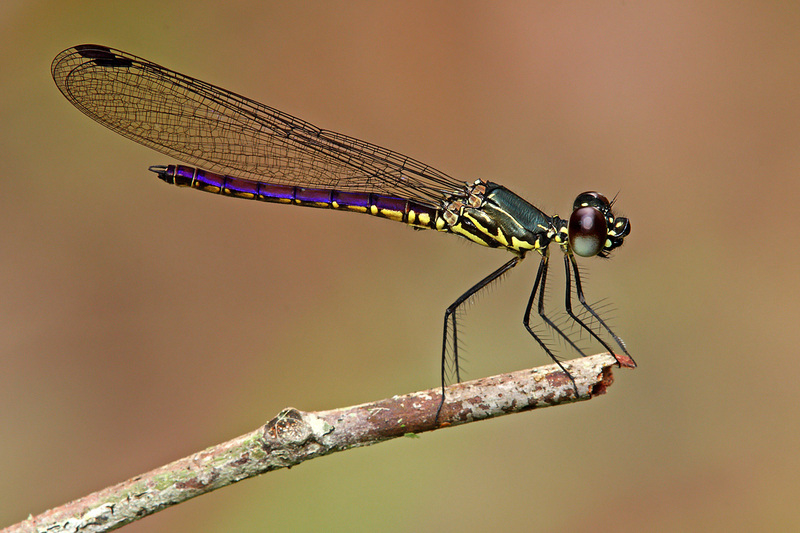 I am referring to the Libellago which is the most unique damselfly genus in Singapore with its wings distinctly longer than the body. They are rare, attractive and require pristine habitat. 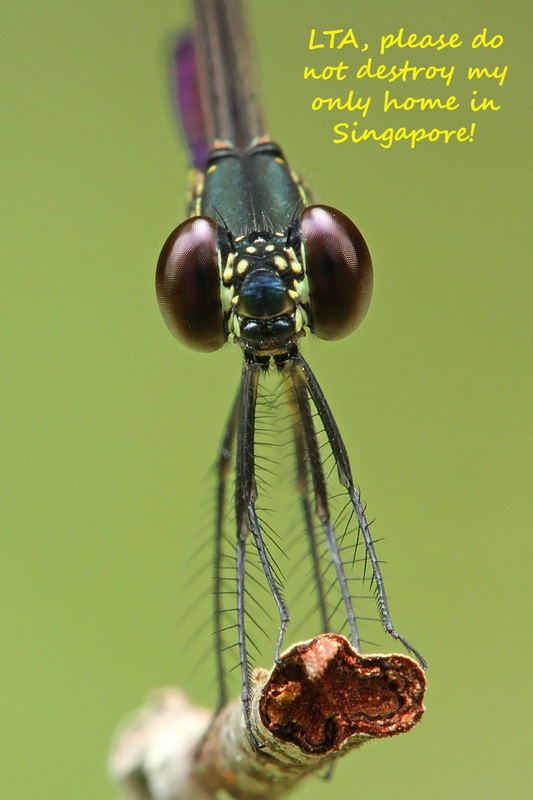 I have rated them as the most beautiful damselfly species in Singapore! 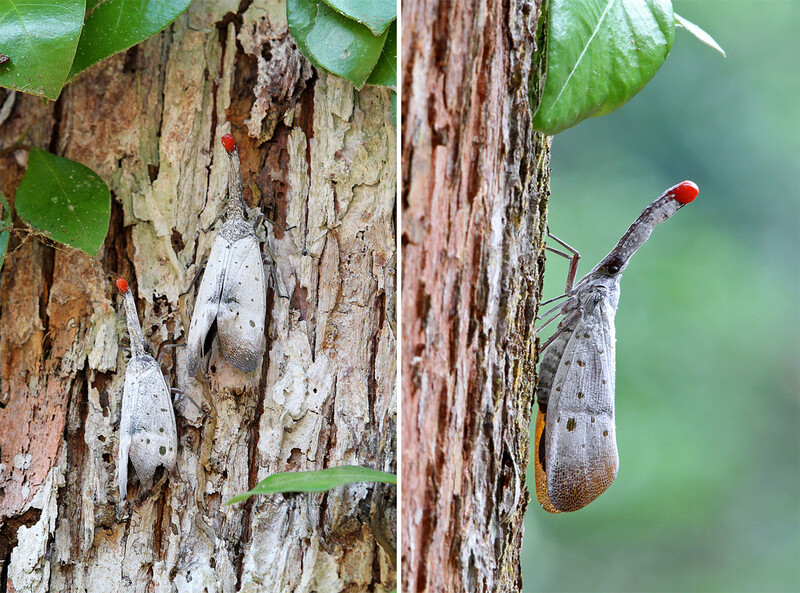 We used to have 4 Libellago species in Singapore checklist but unfortunately, one of them known as Libellago stigamtizans (Orange-faced Gem), is already extinct here. The following image of a L. stigmatizans in flight was photographed in Malaysia. The remaining 3 Libellago species can still be found locally. They are Libellago lineata (Golden Gem), Libellago aurantiaca (Fiery Gem) & Libellago Hyalina (Clearwing Gem) and we should protect these Gems to the best of our ability. Libellago lineata has a relatively higher chance of survival as it can be found at two locations, one at a protected area in Mandai forest not accessible by the general public, and the other one at Lower Peirce Reservior. egg-laying process, male guarding the egg-laying female) of Libellago lineata all taken at the edge of Lower Peirce Reservior. Libellago aurantiaca has been recorded in Upper Peirce forest and Lower Peirce Reservior but both areas would be affected by the CRL. They are usually found in swift clear streams, typically with a sandy bottom and perch just above water as shown in the image below. I particularly like the male which is striking beautiful dressed in vibrant colour of red and yellow. All the females of Libellago genus are less attractive with duller colours and L. aurantiaca is no exception. When both are displayed side-by-side, it is not difficult to tell which gender is more eye-catching. 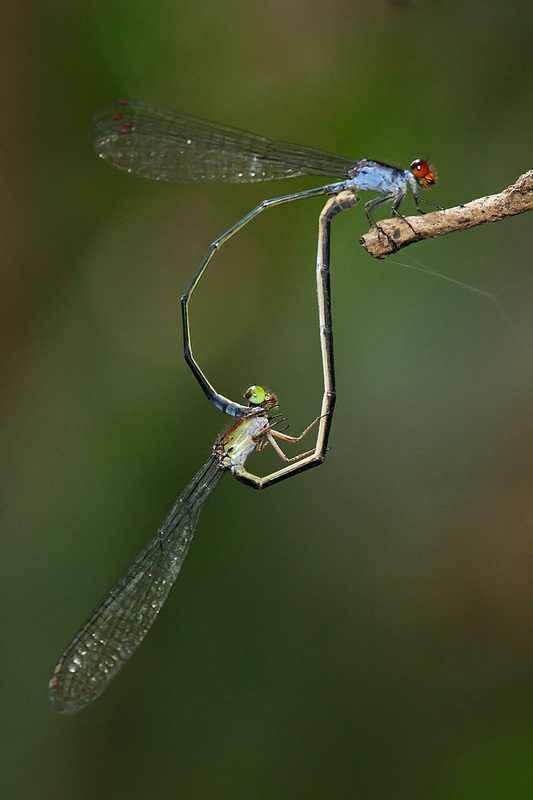 Mating of any damselflies is a joy to watch, not to mention this cute and gorgeous gem in a wheel or love shape formation. The most vulnerable of them all has to be the Libellago hyalina simply because their only home is at Upper Peirce forest. This is a precious species as it shows a great deal of colour variations, both in the female & male. The females have 3 different colours form and I like the one with a “tiger-skin” abdomen the best. The other two females have duller colours and therefore slightly less attractive. The males have 3 colours form too with the bluish grey abdomen being the least good looking. The metallic blue male is more handsome. But I like the glowing purple abdomen male the best. 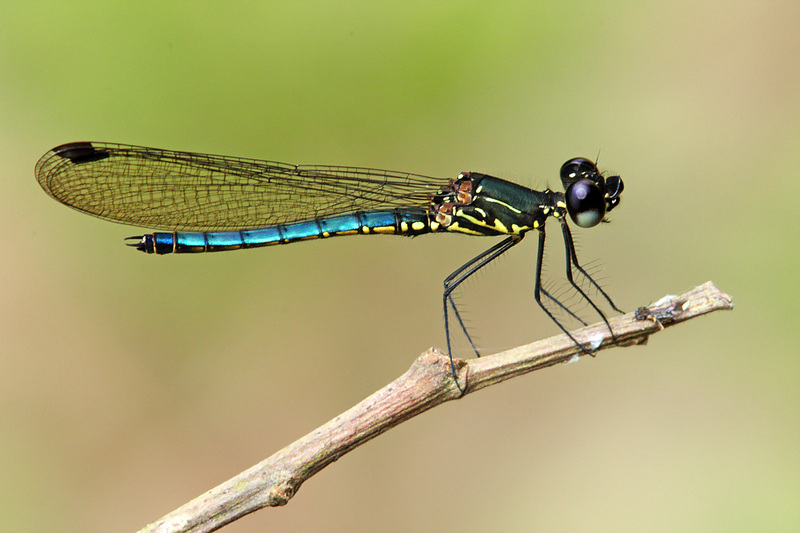 With a total of 6 colours, surely it must be the most colours form damselfly species in Singapore! While doing a search of this species over the internet, I have found images of female L. hyalina from other countries that look similar to ours. 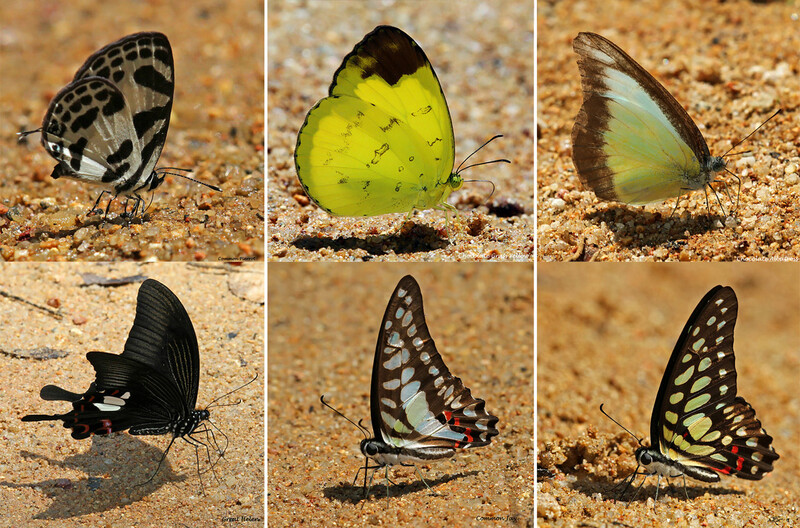 However, the colours of the males are different from Malaysia, Thailand, Indonesia & Cambodia. 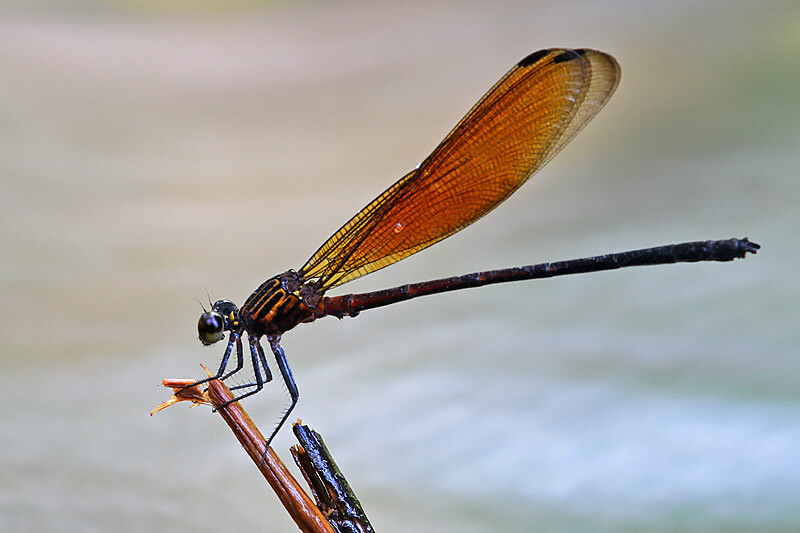 In other words, the 3 colours form of the male Libellago hyalina above could be uniquely Singapore that cannot be found anywhere else on Earth! This makes it all the more valuable and should be protected at all costs! In the event that the CRL has to proceed to meet the infrastructure development needs of Singaporeans, LTA should find ways to guarantee zero disturbance to our nature reserves and ensure the survival of at least the critically endangered species. 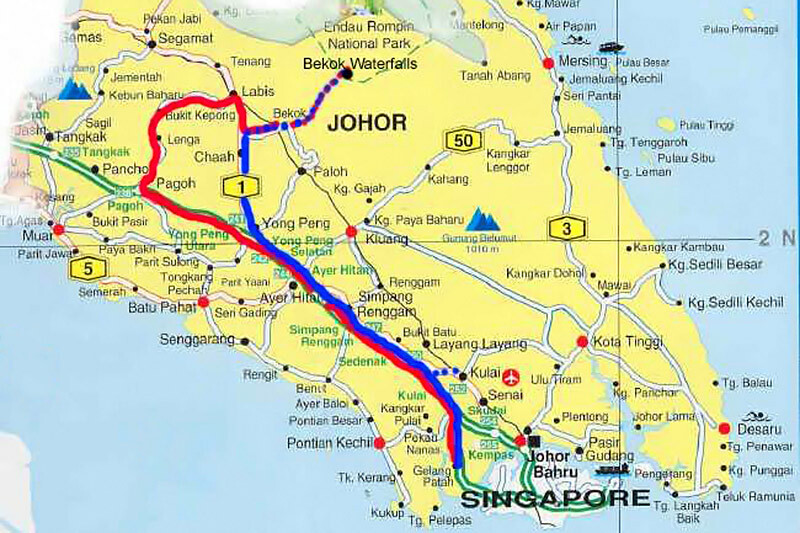 Bekok is a town located at the eastern side of the district of Segamat, Johor, Malaysia. 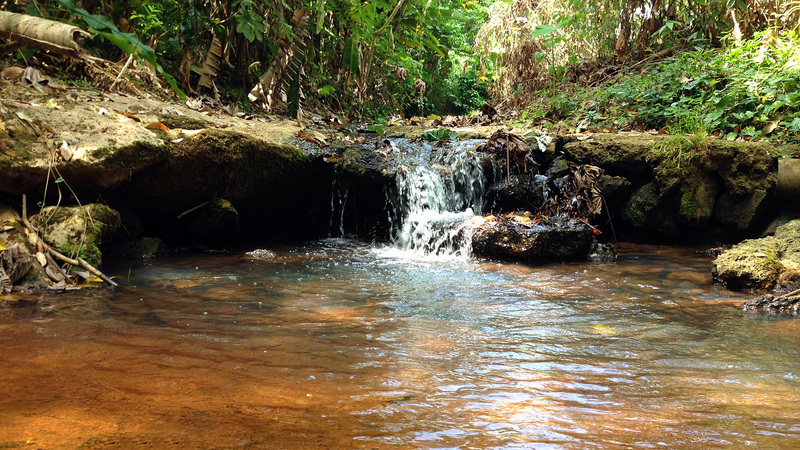 Bekok is well-known especially among nature lovers since Bekok is the western entrance to Endau Rompin National Park as well as having a refreshing waterfall known as Sungai Bantang Waterfall. 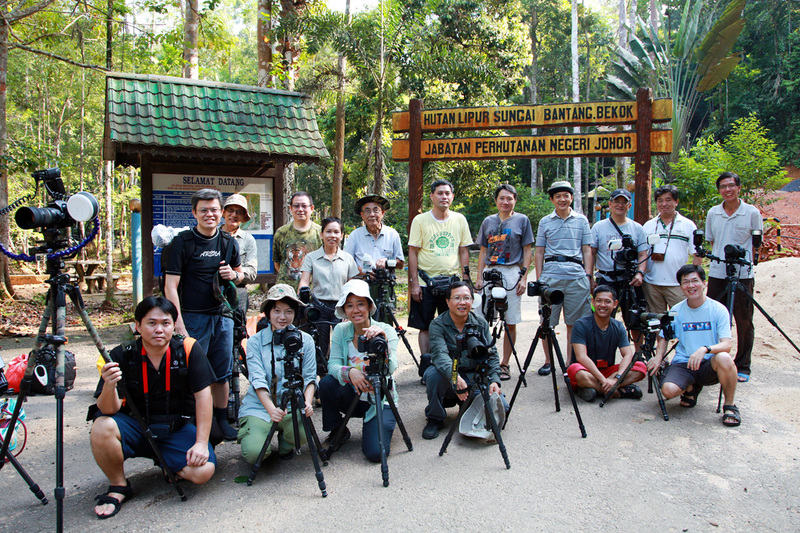 I had visited Bekok waterfall twice, one on a recce mission on 25 May 2013, and the recent one on 29 June 2013 where I joined Nature Photographic Society, Singapore (NPSS) on a marco photography outing. The meeting point was at the first Esso Petrol kiosk after Tuas 2nd link Customs. 18 of us gathered at 6.35 am, drove to Machap for breakfast and arrived Bekok Waterfall at 9.45 am, approximately 200 km of driving. There is a stream near the entrance and it looks like a place full of damselflies, just like the stream at Gunung Belumut. Unfortunately it was not the case, only a few species could be found. One of which was a Protoneuridae interrupta. In Singapore, it is classified as an uncommon forest species. There were quite a no. of the male Euphaea ochracea, most of them perched just above the fast flowing water. This must be one of the most common forest species in Malaysia. There were a few Aristocypha fenestrella. This is a sun-loving species and they prefer to perch on rocks under direct sunlight. Photographing them is a little challenging as it is difficult to avoid the harsh sunlight. 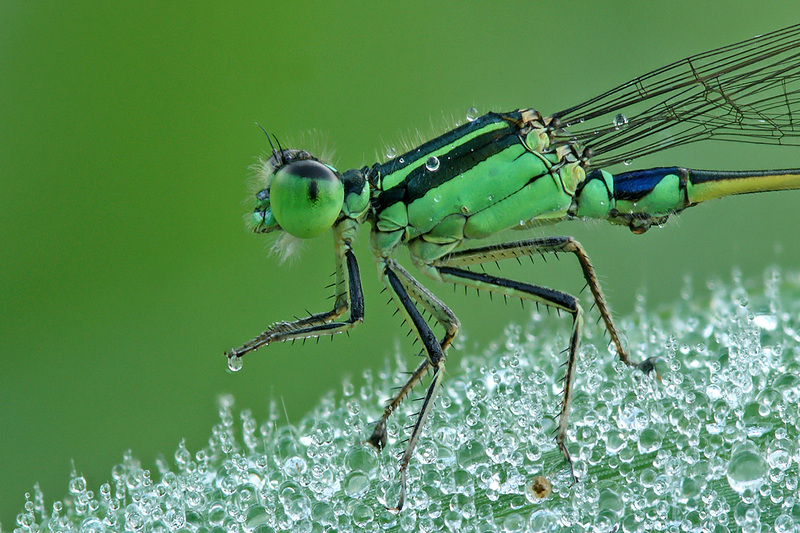 They were also more sensitive to human than the other damselflies species in Bekok. It has a very nice common name known as Peacock Jewel, most likely due to its beautiful metallic colouration on its wing!. 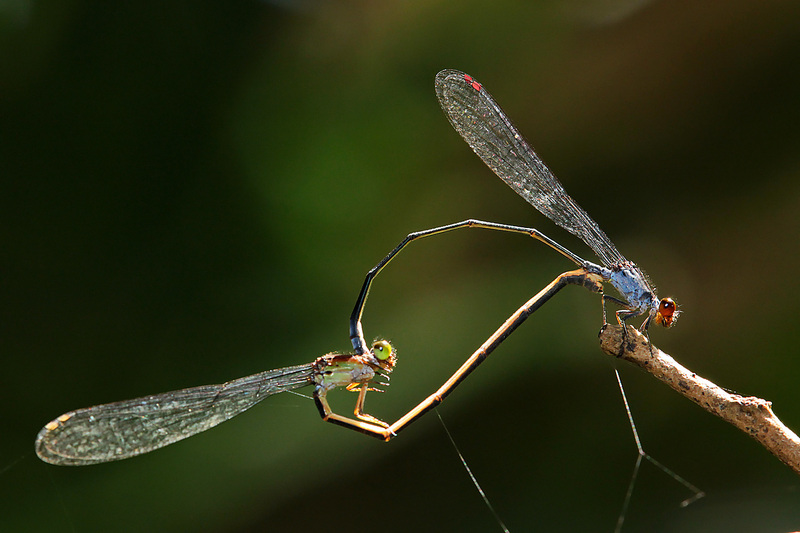 One of the most interesting behaviours of A. frnestrella is when two males are involved in aerial territorial fight. Getting both males sharp while they are fighting in mid-air are extremely difficult. I did not manage to get any decent fighting shot of A. frnestrella but was happy to photograph a male Heliocypha perforate chasing another losing male during a fight! 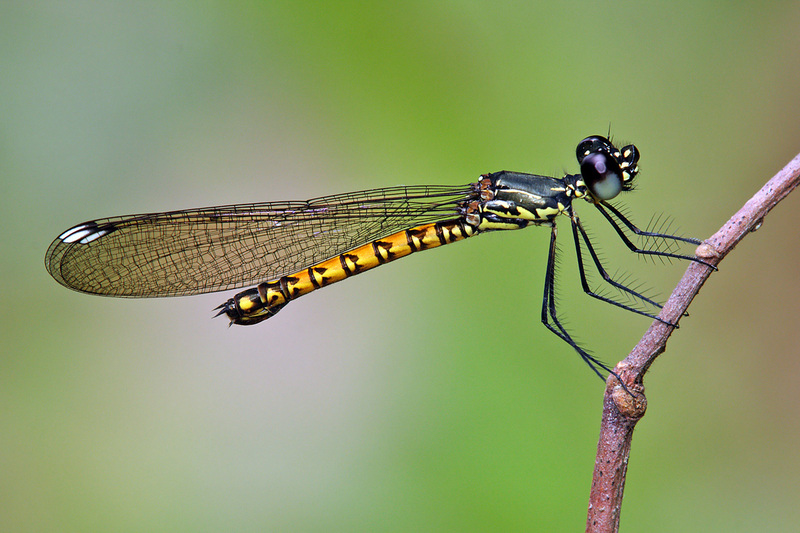 There were some common dragonflies and damselflies such as Spine-tufted Skimmer, Yellow Featherlegs, Blue-sided Satinwing, Common Flashwing, etc which I did not capture them as they are quite easily found in Singapore. 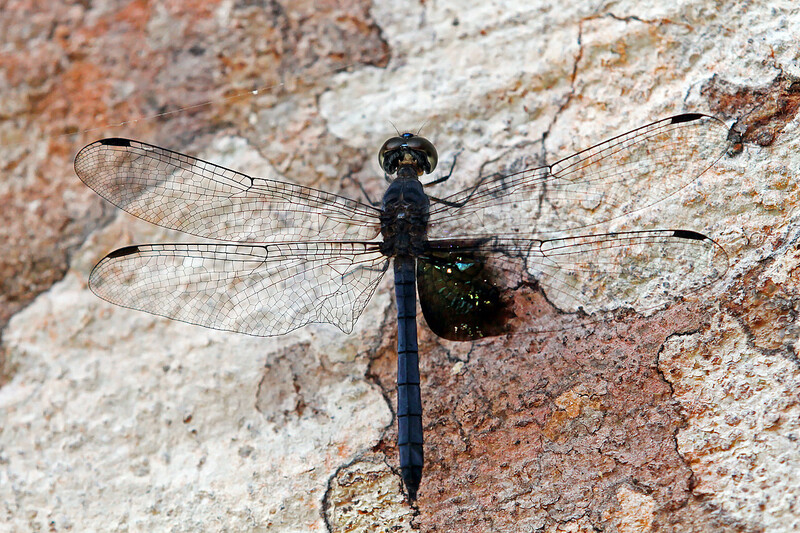 One common dragonfly however caught our attention and that was a male Tree-hugger. It is special because its left wing did not have the metallic bluish-black at the base of the hingwing. While I was disappointed not to find more damselfly species here, it was compensated with the sighting of a few lantern bugs (Laternaria ruhli) on a tree nearby. Lantern bugs are very rare in Singapore, the last official sighting was in October 2009 (See “Records of Lantern Bug … ” by NUS). As none of us have seen lantern bugs in Singapore, we would not want to miss this great opportunity to add this into our collection. I have seen images of lantern bugs taken by friends in Malaysia before but I didn’t expect it to be that big. I think it is about 20% bigger than the common cicada that we see in Singapore. Another highlight of the trip was we found many butterflies, 6 species to be exact, feeding on sandy ground near the edge of the stream. I was not sure what were they feeding on but it must be very tasty as they kept coming back to the same spot. 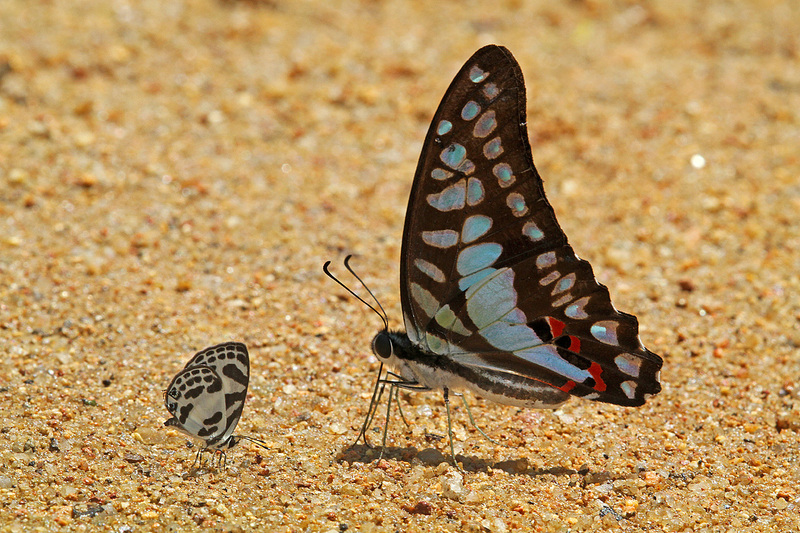 Among all the butterfly shots, the image below is my favourite as it shows the size difference between the tiny Common Pierrot vs the much larger Common Jay (please correct me if I identified them incorrectly). After lunch, we walked through the forested path and soon reached the upper stream where there is a nice refreshing waterfall. This should be the Bekok waterfall that people are taking about. 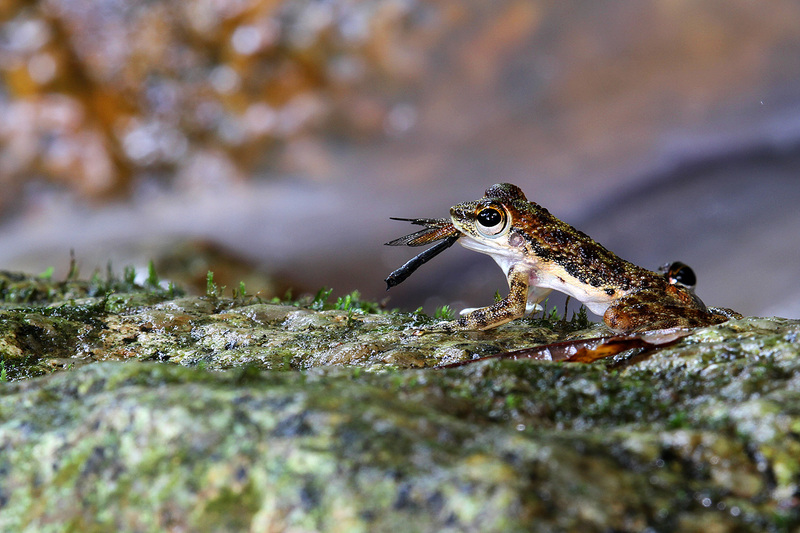 If Gunung Belumut is a heaven for damselflies, Bekok should be a paradise for frogs and toads as we spotted so many of them both from the lower and upper streams. Frogs in particular are photogenic subjects to shoot and it was no surprise to see my friends trying to get the best angles. 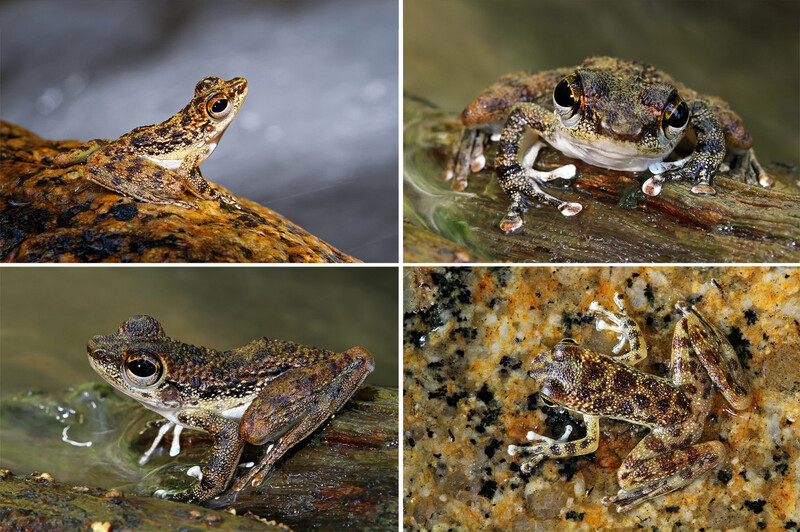 I personally find the Black-spotted Rock frogs most charming and therefore I had shot them with various angles. 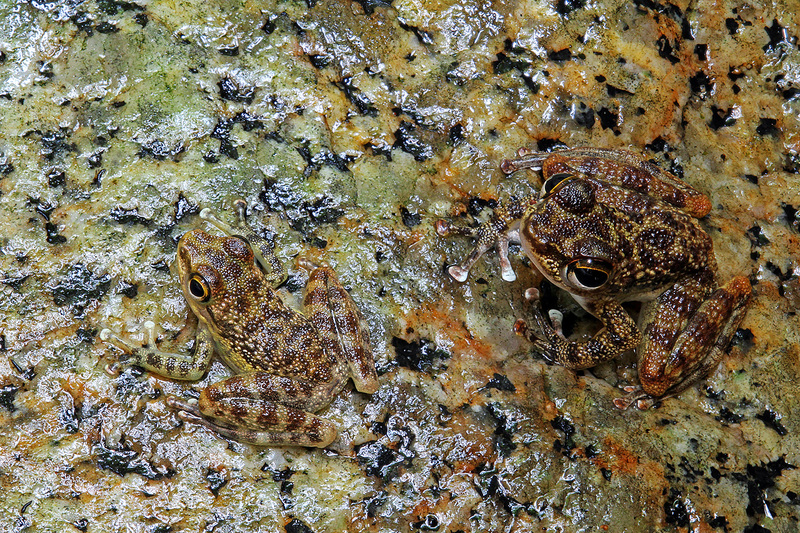 When the black-spotted rock frogs were in abundant, it was not difficult to spot at least 2 of them together. Some of my friends saw 3 to 5 of them in a single spot, I could only shoot 2 in a frame. 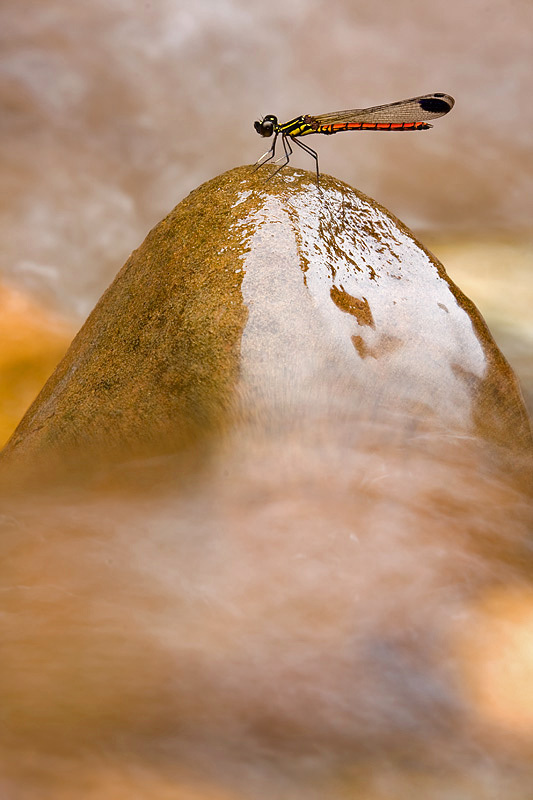 Thanks to my friend, Allan, who found a black-spotting rock frog having a male Euphaea ochracea damselfly as lunch near the waterfall. This is my first time seeing a frog eating and this has to be my catch of the day! 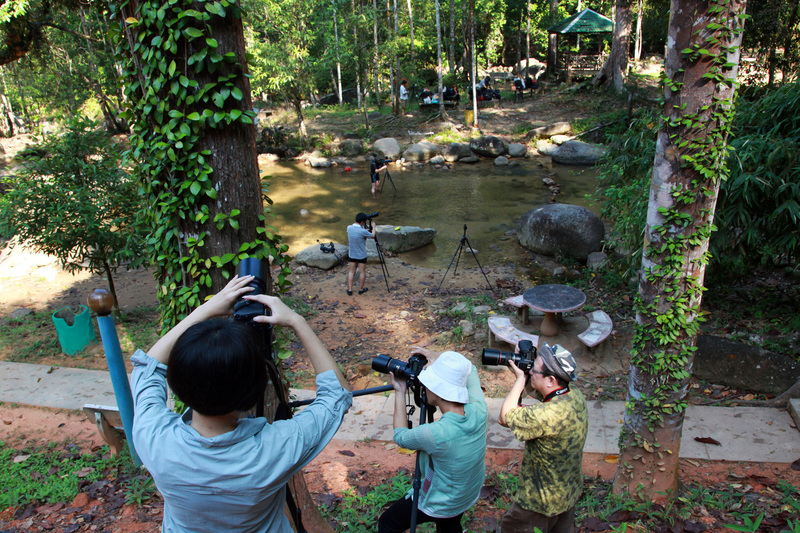 Happy with what I had already shot, I put aside my camera gear to join Yan Leong, Allan & Chiat Pin for a cool dip in the stream. OMG! It was cold in there! 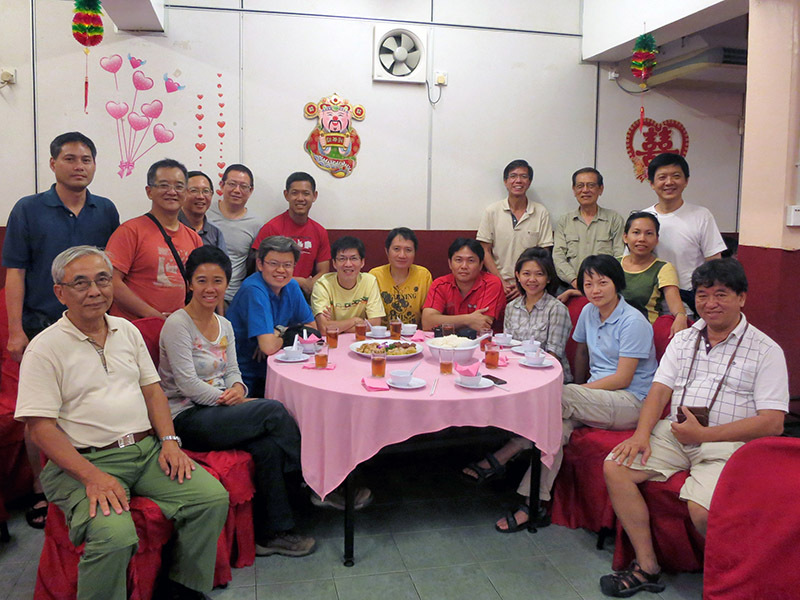 After a tired but rewarding day, we deserved a good dinner at Cathay Restaurant in Kulai. 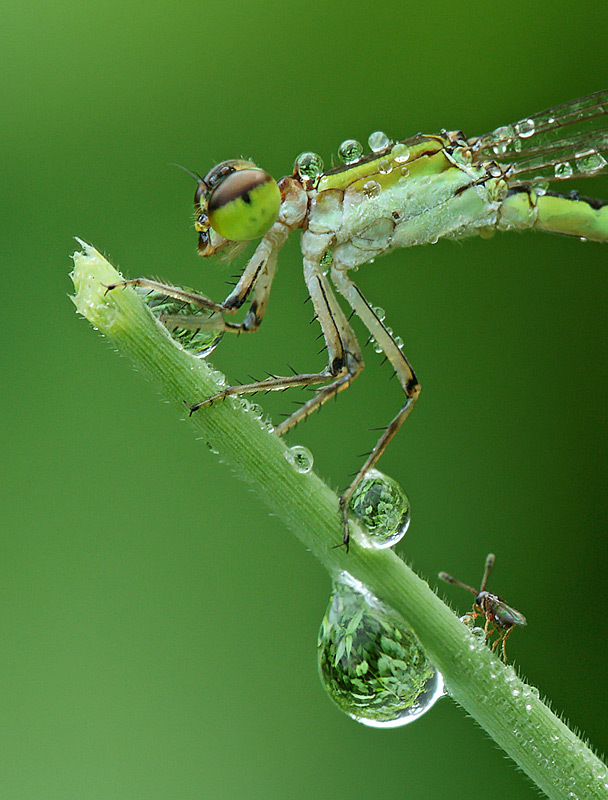 During my early year of learning macro photography, I was often frustrated as I could not get sharp images. Most of my pictures were motion blur due mainly to windy conditions. I soon realized that from the first light of the day (ie. 6.45 am to 7.00 am) to 9.00 am is the best period for newbie like me to practise shooting as there are little or no winds and insects are less active. 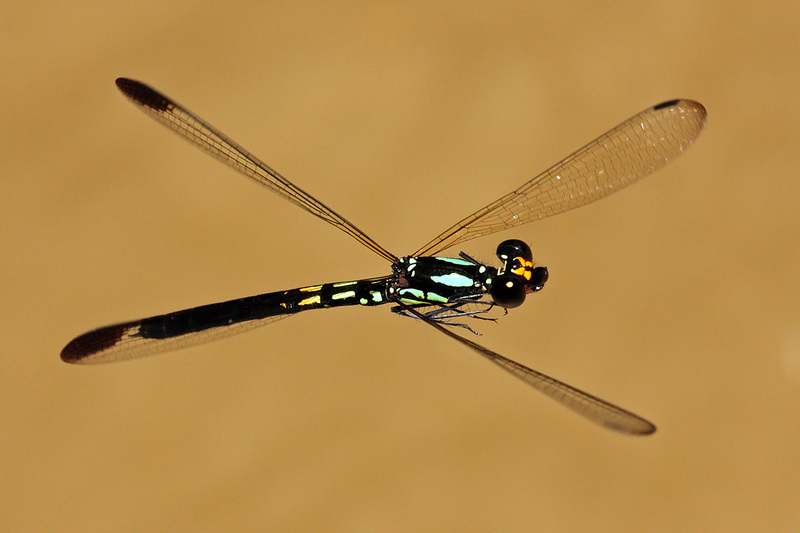 I began to improve and soon mastered the basic skills of macro photography. Shooting very early in the morning has its advantage. You would see lots of dews around the greenery. Morning dews not only complement but very effective in making an ordinary subject looks amazingly different. 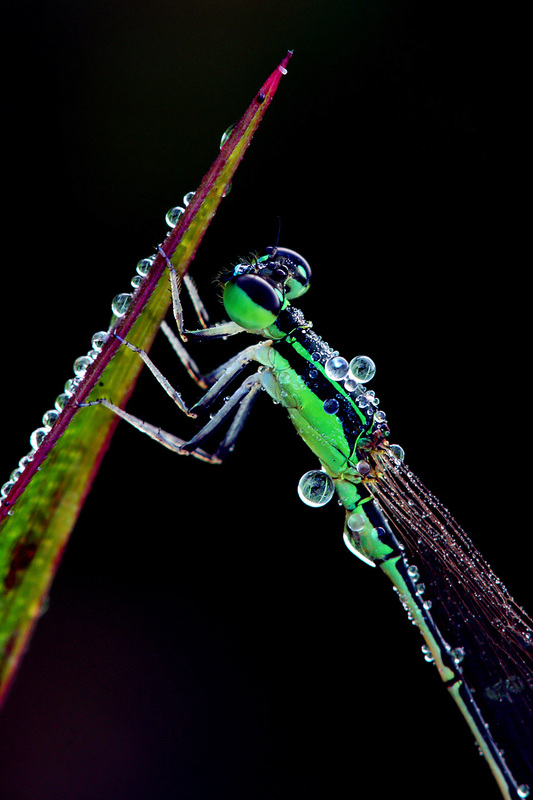 I personally find damselflies covered or surrounded in the morning dews most beautiful and eye-catching such as the above image which is one of my favourites. 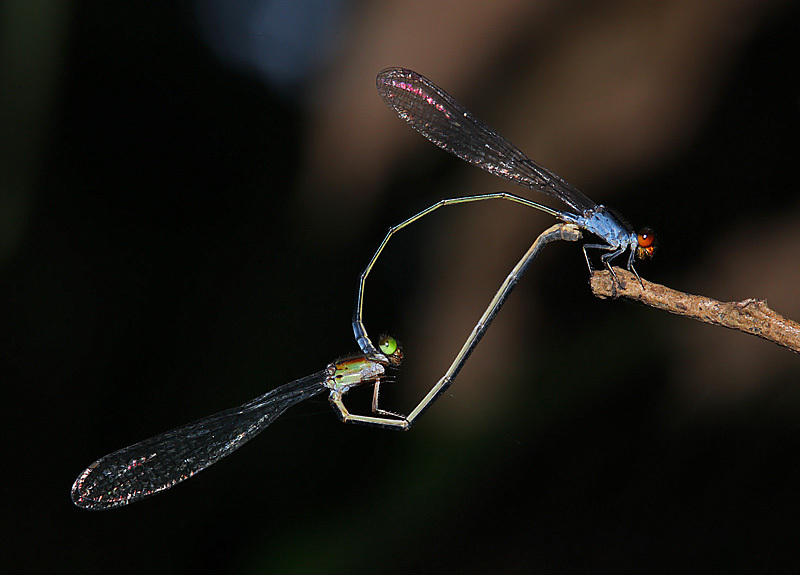 Holland Woods, a greenery opposite Ngee Ann Polytechnic, is an excellent place to photograph damselflies in heavy dews! 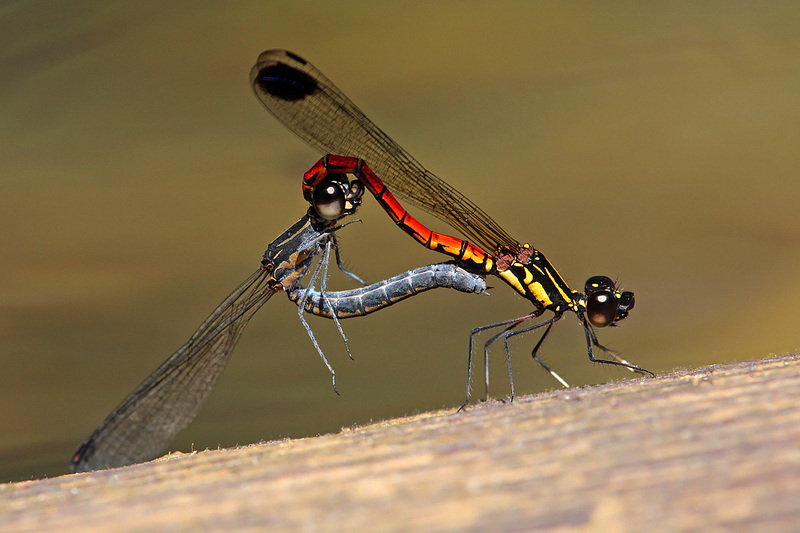 It is a location where the Common Bluetail damselflies are in abundant. 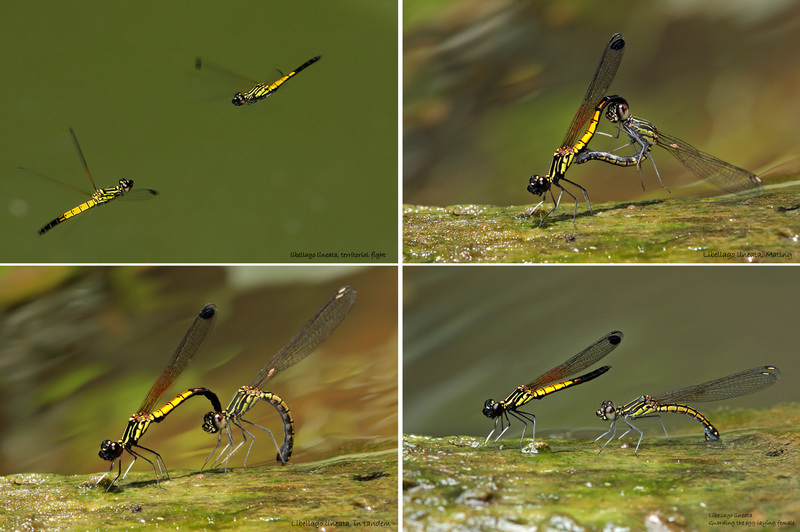 Although this species is very common and widespread throughout in Singapore, it is quite unique as the female has three different colour forms ie Golden orange, Olive green & Bluish green. 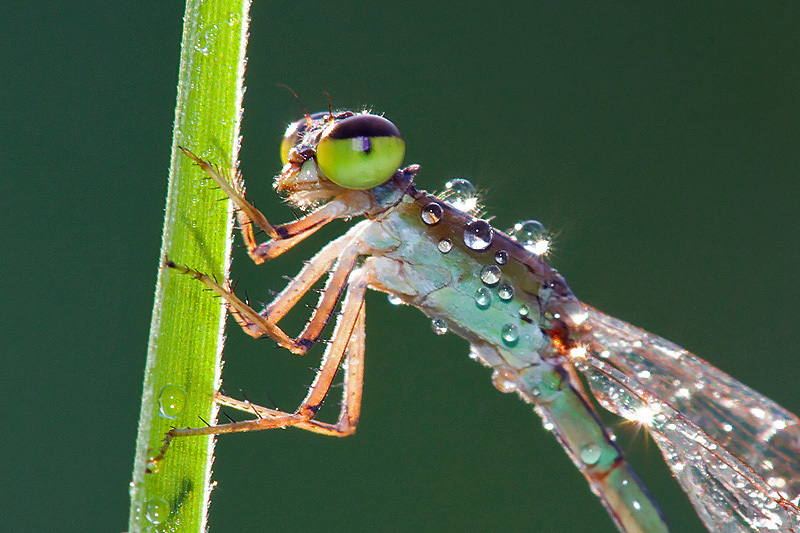 Wild Wild West, a location at the end of Corporation Road, is the next best place to shoot damselflies in dews. Unfortunately, it is now under construction for roads and drains and I heard recently that it will be used for industrial purposes. 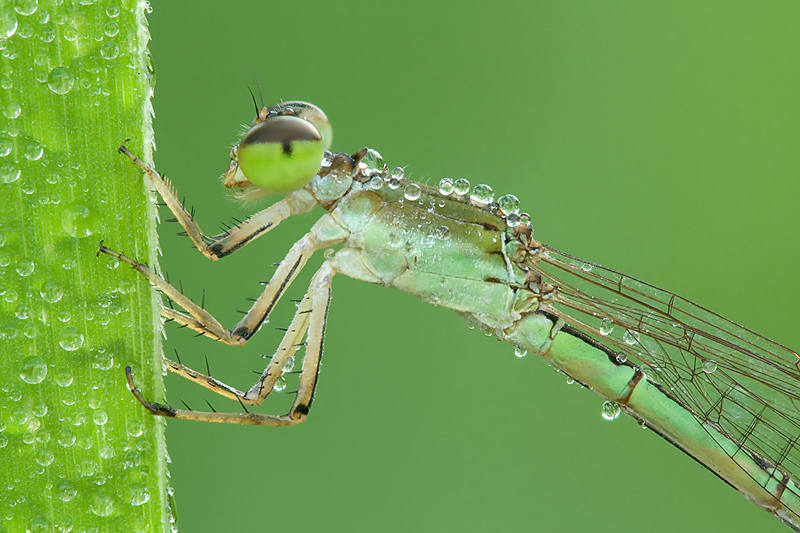 Shooting damselfly in dews with dark background is equally appealing to me. How about one with a backlighting as shown below? If you like these images, wake up and shoot very early like me! This is a relatively small dragonfly spotted at Venus Drive this morning. 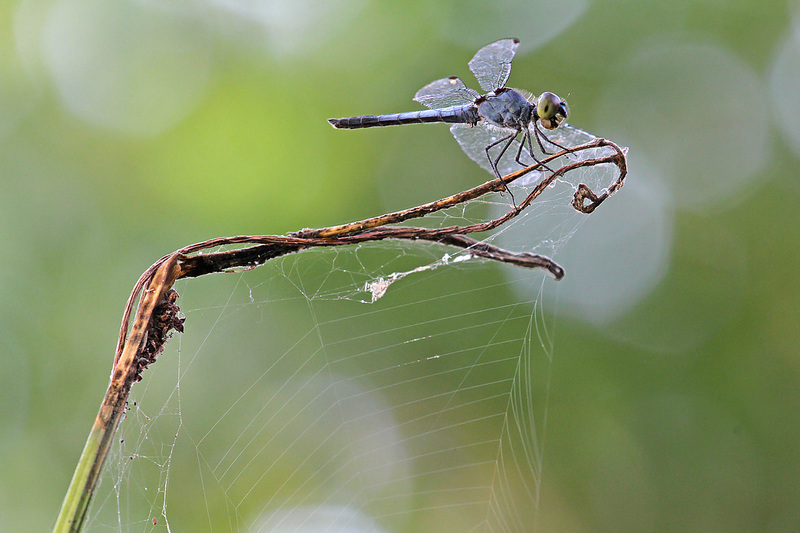 It has very thin abdomen and usually found perched, hanging vertically from high branches. 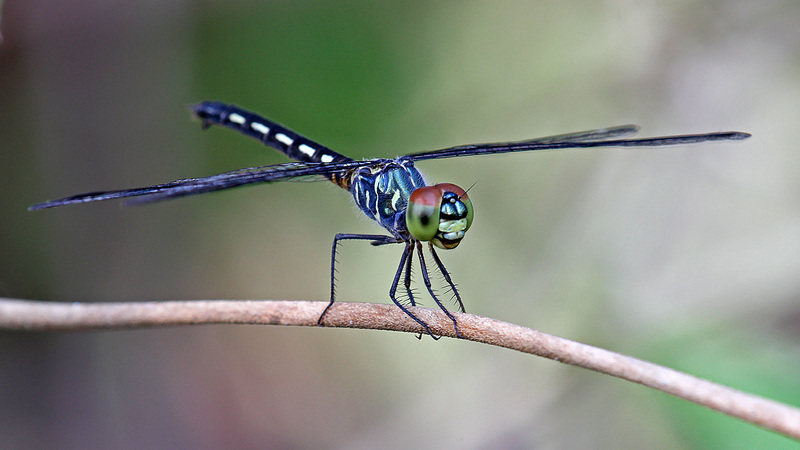 According to Mr Tang Hung Bun’s Dragonflies Book, it was once listed as a critically endangered species in the Singapore Red Data Book, but the present knowledge suggests a less threatened status.